Indoor Soccer Rules when taking the game indoors. indoor soccer rules keep the game organized and fun. Indoor soccer rules are very similar to regular soccer rules, with small differences. This style of soccer is a lot of fun to play for every player that loves soccer or is starting out to play this game. Indoor soccer playing is a great developmental tool available to young players in the United States. European and South American players grow up playing Street Soccer, Futsal and kicking the ball off the wall to develop skills with the ball. United States lacks in having Street Soccer in parks, or kids kicking the ball off the wall, but we DO have many Indoor Soccer Facilities. Indoor Soccer allows players to simply play the game, and the game itself will teach players many skills in soccer. Indoor games are played on an artificial turf, surrounded by boards, and looking like a hockey arena or a skating rink with grass. Fields are usually 200 Ft Long and 85 Ft Wide, or 66 yd x 28 yd. Due to the boards surrounding the field, there are no throw ins, and the soccer ball is always in the game. The action only stops when the ref blows the whistle for one of the Indoor Soccer Rule Infringements, or if the ball is kicked above the boards and into the protective net. Indoor soccer is a fast paced game and needs rules to keep it clean and entertaining. There are no out of bounds and the walls are used by the players, just like in Hockey. Rules for indoor soccer games are the same in all competitive leagues. 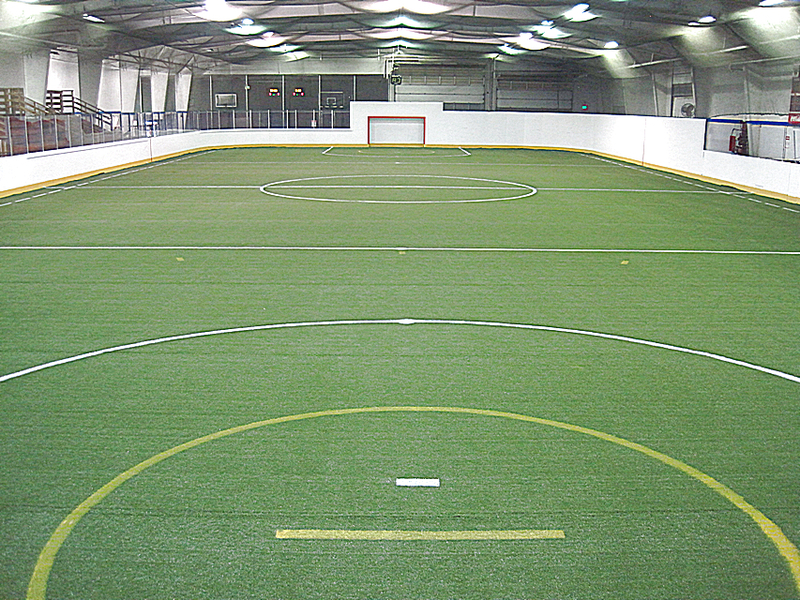 Indoor soccer field has to be rectangular or oblong in shape, with artificial turf playing surface. Walls surrounding the field should be at least 6 feet tall. Professional indoor soccer games are 60 minutes long. This time is divided into four quarters of 15 minutes, as stated in the rules for indoor soccer. There is a 3 minute break in between quarters, with 15 minute break at half time, or after the second quarter. If the game is tied, there will be 2 extra 15 minute halves of play, with a golden goal rule (team that scores first wins the game). Amateur league games are played with two 22 minute halves. There is no overtime for tied games in Amateur Leagues. Indoor soccer matches are played with 5 outfield players and a goalie. Substitutions are permitted and players can be substituted and brought back into play as many times as they want, according to the rules for indoor soccer. Playing off the walls is allowed. Play is stopped when the ball touches the net above the wall or is kicked high and touches the ceiling. Indoor rules require the referee to stop the game and award the ball to the opposite team. Free kick is taken on the sideline where the ball went out. Standard contact rules generally apply. Ball contact must be made during a play on the ball; no charging with hands or elbows, no charging from behind, no holding the opponent etc. Indoor soccer rules ban the use of the sliding tackle, though such techniques are less useful on turf than they are on a slick field. If one attempts to slide on an indoor field, painful burns and/or cuts can occur. Substitutions are unlimited and any player can enter and exit the game as many times as they want. Substitutions happen while the game is in progress, provided that one player leaves the play before another one steps on, as explained in indoor soccer rules. Some Leagues require for the ball to be out of play in order to do substitutions. Yellow, red and blue cards are used by the referee to enforce the indoor soccer rules and keep the game under control. Blue card is issued to players who need little disciplinary action due to a hard tackle or attitude towards other players or the referee. Blue Card ejects that player for 2 minutes, leaving the team with only 4 outfield players. Yellow card is punished by 4 minutes. Red Card has the player ejected from the game and in most cases outside of the building. Indoor soccer is played with a size 5 regular match soccer ball. Some leagues enforce a special zone inside the goalkeeper's box called the crease. No player may shoot the ball from inside the crease unless that player entered the crease already having the ball. Soccer ball kicked from one end of the field may not cross three lines without touching the ground. These lines are evenly spaced along the length of the pitch, with one of them being the exact center. The rule is used to avoid playing long balls and to keep the ball on the ground. Violations are punished with a free kick at the first line closer to the goal. For more information on indoor soccer rules please visit the Official USSF Indoor Soccer Rules.